A warning light is flashing in the bond market. An obscure measure known as the yield curve is flattening. That means the gap between short and long-term Treasury rates has narrowed. The flattening yield curve signals concern that the Federal Reserve could be hitting the brakes on the economy so hard that it inadvertently puts the United States into another recession. 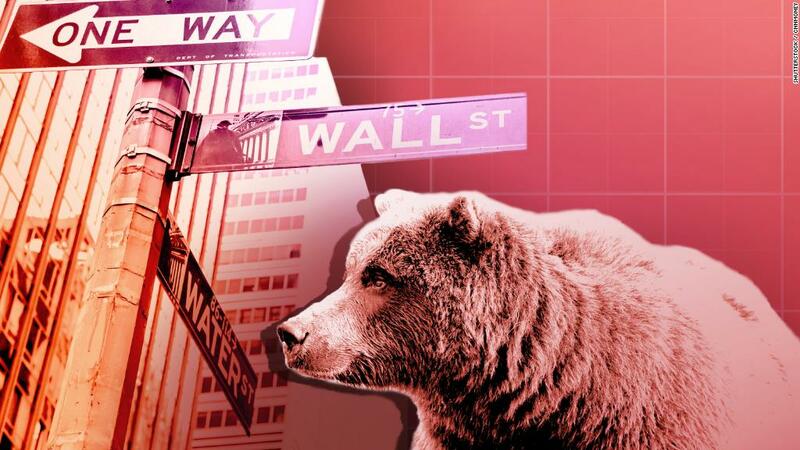 Stocks tumbled on Tuesday after the yield curve narrowed to nearly the smallest point since before the Great Recession. "People are worried the Fed will keep tightening us into an accident. Historically, that's what usually happens," said Peter Boockvar, chief investment officer at The Bleakley Advisory Group. Even if that's not the case this time, the flatter yield curve is bad news for banks, which pay interest on short-term rates and lend at long-term rates. Bank stocks like Citigroup (C) and PNC (PNC) fell sharply on Tuesday. The action in the world's largest bond market also raises the specter of the yield curve eventually inverting, meaning short-term rates would be higher than long-term ones. Such a phenomenon is rare -- and spells bad news. It's widely believed to signal a looming recession. It happened prior to the Great Recession as well as the 2001 downturn. "History shows that inverted yield curves have tended to trigger financial crises, which have caused credit crunches and recessions," Ed Yardeni, president of investment advisory Yardeni Research, wrote in a recent report. The yield curve is nowhere near inverting right now, and few economists expect a recession on the horizon. Growth is expected to be strong this year, thanks in part to Washington stimulating the already-healthy economy with tax cuts and extra spending. Just last month Wall Street was concerned the economy could overheat, creating a burst of inflation the Fed would have to cool off by raising rates aggressively. The 10-year Treasury yield spiked above 2.9%, sending the stock market into turmoil. Investors feared a move above 3% would spark more turmoil. Now, the shrinking 10-year yield is spooking Wall Street. "It shows that markets can be fickle," said David Kotok, chairman and chief investment officer of Cumberland Advisors. The 10-year yield has descended sharply to around 2.75% because of a range of factors, including a flight to safety during the recent stock market turbulence and easing concerns about the threat of inflation. It also reflects expectations for softer economic growth at the start of 2018. Barclays trimmed its first-quarter GDP forecast to 1.8% on Wednesday. At the same time, two-year Treasury yields have climbed to their highest levels since 2008 because the Fed has suggested it will continue hiking rates. Short-term rates are more closely linked to Fed actions. Those diverging forces have narrowed the yield curve. That's caught Wall Street's attention. "I don't think it's suggesting an imminent recession, but it is signaling the Fed may be too aggressive," said Greg Peters, senior investment officer at PGIM Fixed Income. Morgan Stanley analysts called the flattening curve a "potential warning" and key gauge of concerns about the Fed "getting ahead of itself." Jerome Powell, the new Fed chief, was even asked about an inverted yield curve during his debut press conference last week. Powell suggested it might not signal a recession this time. He noted that in the past "inflation was allowed to get out of control, and the Fed had to tighten, and that put the economy into a recession." Powell added, "that's not really the situation we're in now." Powell's comments didn't shift attention from the bond market though. "It's worrisome that Powell pooh-poohed the fact we're close to an inversion," said Jay Hatfield, CEO of hedge fund Infrastructure Capital Advisors, which manages a series of ETFs and hedge funds. Hatfield called it "probably the most reliable economic indicator in the history of economics." Kotok is watching the yield curve "like a hawk," but he's not worried about a downturn yet. He argued that the double whammy of tax cuts and government spending will be powerful enough to offset the Fed tapping the brakes on growth. "I'm not ready to take this as a recession message," he said.